In today's post, I want to discuss two ingredients which can help you reduce the fat in your meals, while giving up no flavor. The advantage of a plant based diet is that you are not introducing saturated fat into your food. We all want to eat healthier, but we still want to have our favorite comfort foods. I used to think that no fat, read as "no meat", meant no flavor. However, I knew there had to be a way to create the flavor without the meat. Enter two very basic items. Vegetable oil and liquid smoke. These two ingredients can transform your cooking. Oil is essential for sautéing and browning, but an often overlooked fact, is that it adds mouth feel. What that means is it adds a texture and a slick quality to foods. When you add liquid smoke into the equation, you get oily feel and smoky flavor. Hummmm....what does that sound like? Exactly, bacon! So here is an example of a traditional Southern dish, which can be made using these two ingredients. I should point out that collard greens are packed with antioxidants and vitamins. 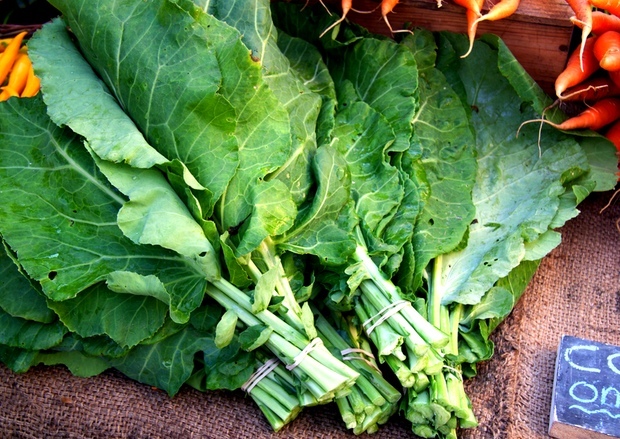 1 1/2 lbs Collard Greens or a mix of collard and mustard greens. 1-2 tsp Liquid Smoke, depending on your preference. 1 tsp Chili Flakes, more or less to taste. Begin by preparing your greens. You will need to cut out the tough stem. Or you can often buy them already cut and cleaned in the vegetable section. If you are going to prepare them yourself, just lay the leaf flat and use the pointed end of a knife to slice out the stem. Then roll them all together and cut into strips. Rinse them thoroughly and drain. Put all the ingredients together into a large saucepan and simmer covered for 35 minutes to 1 hour depending on how you like your greens. You can serve them with extra cider vinegar and chili flakes. These are so good. For those of you who don't know the meaning of "snaps", in Southern VA, that's what we call green beans. 1 pound of Green Beans, trimmed and cut in half. Sauté the chopped onion in the saucepan, just until the onion is translucent. Stir in all ingredients, except the green beans, and bring to a boil and then add the green beans. Simmer for 20-30 minutes depending on how done you like your beans.